We know the Autumn conference planning is in full swing. You have a team of people coordinating and contacting and creating and figuring and on and on. And, we know you are sitting there working on the content so it is relevant and energising and fun and that you get the biggest bang for the buck. And yet, your conferences engender more dread than excitement. More quiet whinging than positive buzz. What is that about? We’ve done some research, which always uncovers interesting stuff. The cost of conferences, and large meetings, is a hard nut to crack because how do you manage ROI on conferences when it is challenging to measure their true impact. How do you truly measure productivity right before, during and immediately after the event. Our research indicates that for the most part large conferences (150 or more delegates) you can expect to spend between £1,000 to £2,500 per delegate (US$1,600 to $4,000) for a two-day meeting. Multiply that times 150 delegates as a base and you can expect to spend between £150,000 to £375,000 (US$240,000 to $600,000). Depending on the type of meeting and you may have further financial impact from removing people from their immediate tasks that impacts productivity. Of course, for a marketing / sales meeting that includes clients with your sales and marketing team the calculations would be somewhat different. But with all the impact quantified and calculated you could be talking about a financial impact of between £300,000 to £675,000 (US$480,000 to $840,000). That is a chunk of change! Are you truly engaging your people equal to the costs? Is the impact of the event such that the costs can be amortized to justify the financial impact? We do not argue against conferences and large events. In fact, for some companies, they can be an essential part of the strategy to communicate with stakeholders, support relationships, encourage team building and land sales. Where to get the best bang for the buck? 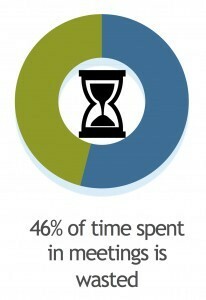 Our point of view is about making conferences more effective. Making large group meetings more impactful and actually increasing the buzz factor from them precisely because they are more engaging, stimulating and relevant to delegates jobs back at the office. Large meetings and conferences can be facilitated, and not simply stage managed, by linking them to larger messaging and engaging that message in conversations, not just card-deck presentations, data and statistics, and presenters who are not connected to the content. Looking at these budgets as outlined above, if a company took 10% of that and engaged our facilitation services we are confident that the return on the investment will be felt by the delegates and stakeholders for much longer, impacting their productivity, engagement and enthusiasm for more. Maybe forget the comedian and the fireworks that have a fleeting effect. Add a thoughtfully planned and integrated conversation about the organisation. We know you will get a bigger bang for your buck. To learn more about how we facilitate conferences and large group meetings call us at +44 (0)1628 471 114 or complete the contact form mentioning your conference and meeting particulars. We’ll get back to you quickly as we know your Fall conferences are developing quickly.